In the wake of the recent United Airlines incident in which it forcefully removed a passenger randomly chosen by a computer to give up his seat for a United employee, homeland security authorities have indicated in background interviews with Homeland Security Today that airlines, working in cooperation with the Department of Homeland Security (DHS) and Intelligence Community, could, in the event a passenger already onboard is discovered to be a known or suspected terrorist, an airline could be asked by authorities to use the same excuse United used to announce to passengers that a computer randomly selected some to be removed to make way for employees due to overbooking. 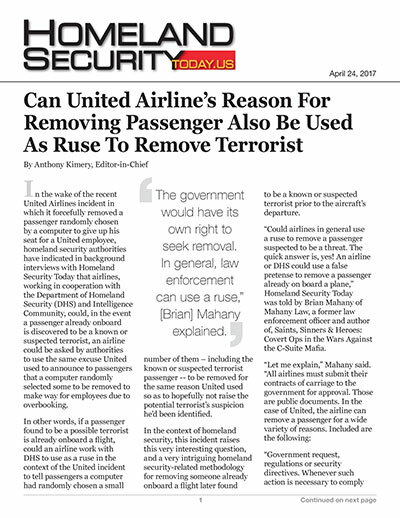 In other words, if a passenger found to be a possible terrorist is already onboard a flight, could an airline work with DHS to use as a ruse in the context of the United incident to tell passengers a computer had randomly chosen a small number of them – including the known or suspected terrorist passenger -- to be removed for the same reason United used so as to hopefully not raise the potential terrorist's suspicion he'd been identified. In the context of homeland security, this incident raises this very interesting question, and a very intriguing homeland security-related methodology for removing someone already onboard a flight later found to be a known or suspected terrorist prior to the aircraft’s departure. “Could airlines in general use a ruse to remove a passenger suspected to be a threat. The quick answer is, yes! An airline or DHS could use a false pretense to remove a passenger already on board a plane,” Homeland Security Today was told by Brian Mahany of Mahany Law, a former law enforcement officer and author of, Saints, Sinners & Heroes: Covert Ops in the Wars Against the C-Suite Mafia. “Government request, regulations or security directives. Whenever such action is necessary to comply with any government regulation, Customs and Border Protection, a government or airport security directive of any sort or any governmental request for emergency transportation in connection with the national defense. “Whenever refusal or removal of a passenger may be necessary for the safety of such passenger or other passengers or members of the crew. And, “The government would have its own right to seek removal. In general, law enforcement can use a ruse,” Mahany explained.